We know that it can be difficult to follow your favorite track athletes throughout the summer with races in different countries and schedules changing often. We’ve made this Summer Racing Guide to give you some idea of when the big BTC events are. This schedule is incomplete as some races are still be sorting out (and if your favorite athlete is missing that’s probably why). To make sure you stay up to date on all BTC racing, follow @BowermanTC on Twitter and Instagram! Held in Atlanta, GA, the Atlanta Journal-Constitution Peachtree Road Race is the largest 10k in the world with around 60,000 participants every year! The last few years it has doubled as the USATF 10K Road Championships and will do so again this year. Lopez looks to make it a Track/Road double at 10K national championships, while CD will try and add another road title after winning the USATF Half Marathon title earlier this year. Gwen returns to familiar territory: she was dominant in the 10k road races that end Olympic Distance triathlons throughout her career. Both Matt and Moh look to defend their National titles from 2017 in Ottawa. How to Watch: There should be a live stream here, along with heat sheets schedule and ticketing information. After winning the Pre Classic, Shelby will look to cement her status on the world stage at 1500m in Switzerland. Schedule, start lists, and results (when available) will be here. How to Watch: All Diamond League meets in the US are on NBC Sports Gold and either NBCSN or the Olympic Channel. Kate will drive down from the mountains of St. Moritz to run some under distance in Lucerne. This meet is on the smaller side, but has a great atmosphere and usually fairly decent conditions. Diamond League points and fast times are the mission for Matt and Ryan in Morocco. Top 8 in each Diamond League race get points to qualify for the Diamond League final held later in the summer. Ryan is particularly well positioned to score points with this race being a 3,000m, the distance at which he is the 3rd fastest American of all time. Schedule, start lists, and results (when available) will be here. Kortrijk is a part of the Flanders Cup, a series of races in Belgium that are popular with US athletes. Josh will spend the summer trying to lower his personal best in the steeplechase and gain valuable experience for the future. Vanessa will look to lower her 4:10 personal best at 1500 and tune up her speed ahead of the Huesden 5,00m (see below). Evan on his way to his first Diamond League win in Monaco, 2017. 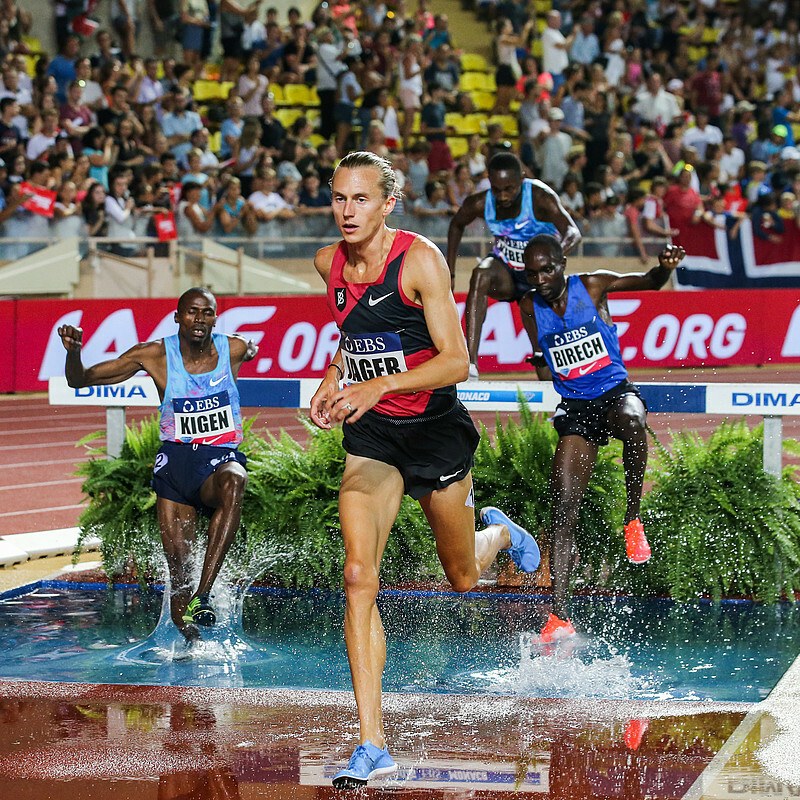 One of the jewels of the Diamond League circuit, Monaco was the site of Evan’s first American Record in 2012 and his first Diamond League win (2017). The pace will hopefully be set up to offer a chance at a sub-8 minute clocking. Courtney and Matt will be both be hunting personal bests on own of the fastest tracks in the world. Track returns to the Olympic Stadium in London, which has become one of the best venues in the sport since 2012. The European track circuit will take a break in early August for the European Championships, so this looks to be Moh, Ryan, and Kate's final race before returning to the US for a month of training. They will return in late August to hopefully compete in the Diamond League Final and the Continental Cup. Held in Cape Elizabeth, Maine and founded distance running legend, Joan Benoit-Samuelson, Beach to Beacon is one of the classic US road races. It always features a world class field and a world class lobster boil. The European Championships will be held in Berlin’s famous stadium, a fantastic setting for the peak of the 2018 season for European athletes. With Mo Farah departed from the track, the door is open for a new Briton to seize the European title. The NACAC Championships are a regional championships for the North and Central American countries. This year they will be held in Toronto, Canada.